The 95th All Okinawa Togyu (Bullfighting) Spring Tournament, sponsored jointly by the Okinawa Prefectural Bullfighting Federation and The Ryukyu Shimpo. Co., was held on May 8 at the Ishikawa Multipurpose Dome in Uruma City.Twenty-six bulls gave their all in front of 4000 fans who came to enjoy the action. The open-class champion, Arakaze-go, defeated the challenger Furugen Motors in a bout that lasted 15 minutes and 27 seconds, thereby keeping the champion’s flag in his first title defense. In the middle-weight class, current champion Isshinriki showed his power against Higashiyamadairiki, winning in just 26 seconds. Seiryugo won the new champion’s title in the light-weight class, downing Toushou☆meka to win a fight that lasted 18 minutes and 25 seconds. The tournament was held to raise money for the victims of the Great East Japan Earthquake. 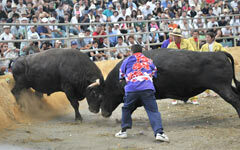 Okinawan bullfighting differs from that of Spain in that togyu pits bull against bull, with men only involved as handlers.